Sometimes it takes me forever to do certain things – make a recipe, watch a movie – and then, when I finally do it, it just feels... bleh. Many, many years ago I watched the trailer for “November” and it intrigued me: I thought it looked interesting and I liked the idea of watching Courteney Cox in a drama: to me, she was the funniest of the girls in “Friends” – to this day I haven’t understood Jennifer Aniston’s wins at the Emmys and the Golden Globes. But then it took me 7 years to watch the movie and... bleh. It made me think of “Stay” – which is a movie I really like – but in a poor way. If you’re not into pastry making, make the chocolate custard only, pour into small bowls and serve, no need to caramelize it – it’s that good. 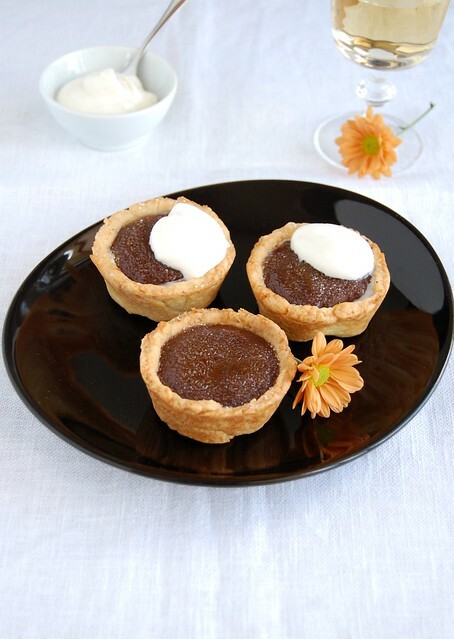 Tart cases: lightly butter eight cavities – 1/3 cup capacity each – of a muffin pan. Divide the pastry into 8 equal parts. Roll each one into a rough circle and line the muffin pan with the pastry. Prick the bases with a fork and freeze for 30 minutes. Preheat oven to 180°C/350°F. Roughly cut 8 pieces of foil – the size of the tart cases – and brush one side with butter. Press the foil pieces onto the frozen pastry (buttered side in contact with the pastry) and bake for 15 minutes. Remove the foil and bake for a further 5–8 minutes or until golden and crisp. Allow to cool completely in the pan on a wire rack. Carefully remove the tart cases from the pan. Filling: place the milk, chocolate and vanilla in saucepan over medium heat and stir until melted. Bring to the boil and remove from heat. Place the egg yolks and sugar in a bowl and whisk until pale and creamy. Add the corn starch and whisk to combine. Gradually pour in the hot milk mixture, whisking continuously. Return to saucepan and cook over medium heat, whisking continuously, for 1–2 minutes or until thickened. Stir through the Amaretto. Set aside to cool. Pour the filling into the tart shells and refrigerate for 4 hours or until set. Sprinkle tarts with the extra sugar and use a blowtorch to caramelize the sugar. Top with the cream to serve. Patricia, these look so lovely, if that's going to be the result, I wouldn't mind making the pastry myself. Thank you for finally triying out the recipe, it looks like a winner to me!